This handsome, 21-story, 162-unit cooperative apartment house was one of the first to be erected after World War II and the last one to be completed by Emery Roth, the architect who designed many of the city's most famous residential skyscrapers. 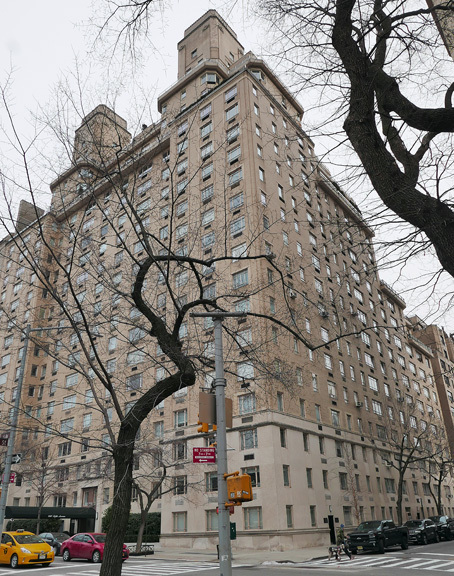 It is the only twin-towered Fifth Avenue apartment building. Built in 1948 for Harold and Percy Uris, who went on to greater fame over the next two decades as the city's most prolific commercial developers, this tower is stylistically related to Roth's building at 875 Fifth Avenue, across 69th Street, and to his earlier Normandy at 140 Riverside Drive. 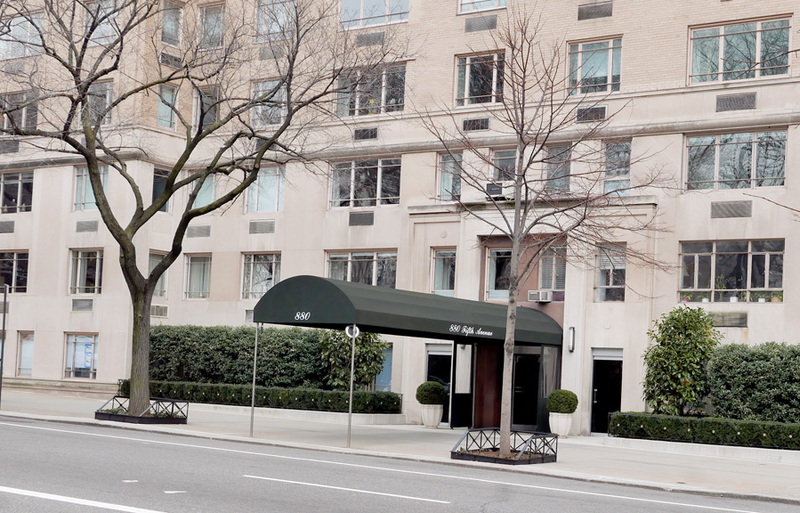 All these buildings set a standard of "luxury" construction in a "Moderne" style that was a few rungs beneath the earlier and grander apartment edifices of an earlier generation on Fifth Avenue, but which were highly influential. Unlike their descendants a decade and more later that used glazed white bricks, these all use buff colored bricks over limestone bases, a far more elegant solution. 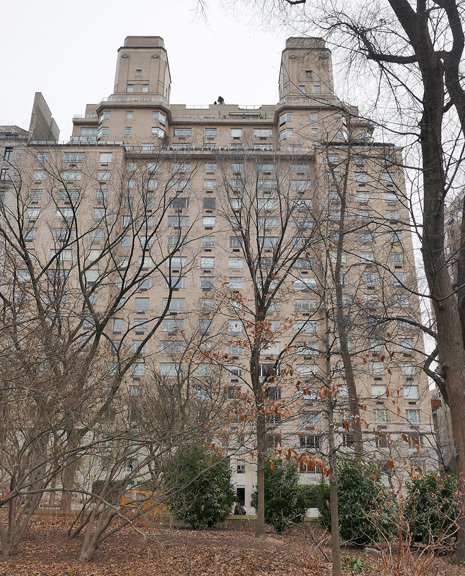 According to Steve Ruttenbaum's excellent book on the architect, "Mansions In The Clouds, The Skyscraper Palazzi of Emery Roth" (Balsam Press, 1986), Roth's plans for this building were significantly altered by his son, Richard Roth Jr., who had just returned from the Navy. When the elder architect asked Richard why he wanted to change his already completed plans, his son, who went on to head the firm, replied, "Father, was that the way you made your reputation?" Ruttenbaum recounts, adding that his father later admitted that he cherished "that reprimand more than any praise." "Except for a few details, it was more modern in conception than any design that ever came out of Roth's office," Ruttenbaum observed. "Undoubtedly, this was due to Richard's influence. The vast expanses of unadorned brickwork decidedly were an outgrowth of Richard's modern aesthetic sensibility. In a few of the details, though, Emery's stylistic predilections were still visible. Simplified classical moldings were wrapped around the Fifth Avenue entrance, and in the two symmetrical towers, flat brick pilasters support stylized capitals that hark bark to the Viennese Secession. In addition, both towers were finished off with courses of patterned brickwork. The apartment layouts of this building also reflect the beginning of a new era in high-rise residential design. All of the suites, which range in size from two to eight rooms, were arranged with a more open plan than was prevalent before the war. 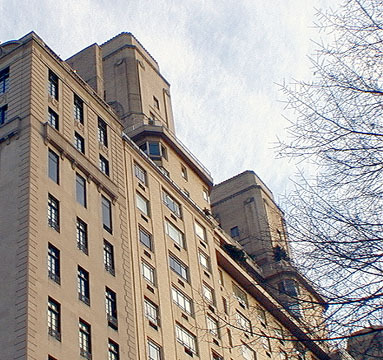 As in Roth's earlier buildings, each unit was planned around an entrance foyer, but, at 880 Fifth Avenue, divisions between some rooms were eliminated.…Each living room has a fireplace, and the larger units have one or more maid's rooms, butlers' pantries and separate service entrances leading to service elevators. And nearly every apartment was endowed with double exposures to facilitate the ventilation of air." Despite such modern touches, the building is a bit bland and too conservative, but then daring was not called for at such a prime and expensive location. The small and very attractive twin towers are most welcome, but the cantilevered balconies near the top are rather disruptive of the façade. The central portion of the avenue frontage is recessed a few feet and is quite barren of detailing, while that façade's ends are very nicely modeled vertically in brickwork to create the impressions of pilasters. Despite its bulk, this rather laid-back building is pretty much a background building to the avenue's grander residences. In their excellent book, "New York 1960, Architecture and Urbanism Between the Second World War and the Bicentennial" (The Monacelli Press, 1995, Robert A. M. Stern, Thomas Mellins and David Fishman note that is building replaced the houses of Edward H. Harriman, which had been designed by Herter Brothers in 1881, and Adolph E. Lewisohn, which had been designed by C. W. Clinton in 1882. "Both houses were vacant and had been purchased previously by a British investor whose plans for their future had been interrupted by the war, causing them to be foreclosed," they wrote.